The level of cadmium in fertiliser production has triggered an intense debate in the EU as analysts fear the bloc could end up entirely dependent on Russia, with dangerous effects for the EU and its farmers. As part of the EU Circular Economy Package, the European Commission presented in March 2016 new rules on organic and waste-based fertilisers in the EU with an objective to boost the use of recycled materials in fertiliser production. The EU executive also aims to introduce harmonised rules on fertiliser production, including limits on contaminants such as cadmium. However, the final limit of cadmium has sparked an intense debate in trilogue meetings between the Commission, Parliament and member states. The Commission proposed a limit of 60mg/kg for three years after the rules take effect, then down to 40mg/kg after nine years and 20mg/kg after 12 years. The European Parliament has suggested a final limit of 20mg/kg after 12 years while the EU Council’s initial position is a limit of 60mg/kg after 8 years. But behind these numbers, a wider geopolitical game is taking place. Critics say the 20mg limit could increase dependence on Russian imports, which would negatively affect EU farmers and put the EU’s geopolitical position to the test. The next trilogue meeting is scheduled for 11 April and a diplomat from the Bulgarian EU Presidency admitted the dossier is of a “highly technical nature”. “Bearing in mind the file’s importance for the circular economy, the Presidency remains ambitious to finalise the negotiations by June. We count that the European Parliament shares that goal. We had a constructive first trilogue in January and during the technical meetings a very good progress was achieved,” the diplomat told EURACTIV.com. The initially planned trilogue date on 20 March was delayed until 11 April on request from Parliament, due to the unavailability of one of the rapporteurs. Four technical meetings were organised in February and March and eight more are scheduled before the next trilogue, which will probably take place in May. “From that perspective, we really appreciated the political engagement of two rapporteurs (from IMCO and ENVI) to finalise the negotiations,” the diplomat said. Cadmium is a naturally occurring metal found in the environment and in reserves of phosphate rock, the raw material used to produce phosphate-based fertilisers. Cadmium is also carcinogenic for humans when ingested in high enough quantities. Greenpeace and the World Nuclear Association have pointed out that Moroccan phosphate is particularly high in cadmium and has appreciable quantities of uranium. Both heavy metals are associated with cancer, kidney failure and bone disease. The Commission insists on the 20mg/kg limit for cadmium in phosphate fertilisers, saying that any higher level would result in cadmium accumulating in the soil, entering the food chain in increasing concentrations and threatening human health. “As an important deliverable of the Circular Economy Package, the Commission proposed this new legislation with the aim to better protect the environment and the health of the European citizens. Our positions remain unchanged and we look forward to an ambitious deal on phosphate fertilisers,” a Commission spokesperson told EURACTIV. But EU farmers oppose the Commission’s proposal and do not support anything below a 60mg/kg level limit. “There is no true scientific evidence backing this approach,” Copa-Cogeca Secretary-General Pekka Pesonen said. EU farmers refer to a November 2015 opinion of the Scientific Committee on Health and Environmental Risks (SCHER), which confirmed there was no accumulation in soils below an average of 80 mg/kg P2O5, revised to 73mg/kg P2O5 after taking into account new worst-case scenarios. “In addition, given the market reality, we would argue for a transition period up to 15 years for the possible 60mg/kg limit. Naturally, we are concerned about the possible constraints to the suppliers to the EU and consequently, we would face uncompetitive upstream markets from farmers’ perspective,” Pesonen added. The case becomes extremely complex when one looks at the market state-of-play and particularly the EU’s dependence on imports. 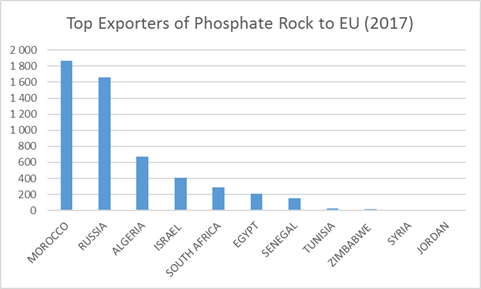 The EU depends heavily on imports for approximately 85% of its phosphate supply, with most coming from Morocco (1.8m tonnes in 2017), Russia (1.6m), Algeria (700k), Israel, and South Africa. The European Commission’s impact assessment raises concerns about Russia’s production capacity and acknowledges its own supply perils. “Practically, the entire EU supply would depend on one single phosphates-exporting country, in the current circumstances Russia,” the paper reads. Asked whether the Commission has taken into account in its proposal a potential Russian monopoly, an EU spokesperson declined to comment. Experts note that Russia is the only country that could meet the EU’s 20mg/kg cadmium threshold and satisfy European fertiliser needs. In the EU, the only commercially viable source of low-cadmium phosphate is in Finland but it produces less than 1 million tonnes, not enough to meet the EU’s needs. The industry fears that having a single supplier, especially Russia, will have a devastating impact on prices and EU farmers could be subjected to political blackmail. Tomasz Włostowski from the EU phosphate fertiliser industry (AEEP) said that any limit below 60 mg means that most, if not all, EU phosphate fertilisers will go out of business. He voiced concerns that depending on Russia “and oligarchs who are chronically corrupt and under threat of possible sanctions would be a devastating position for any EU industry or company which is used to operating by the rule of law and with transparency”. But Włostowski stressed that, unlike Morocco and North Africa, Russian producers have limited amounts of phosphate rock (apatite) so they have to prioritise domestic fertiliser production, instead of exporting just the raw material. “This is part of the Russian national development plans (exporting finished products, not raw materials), but also makes commercial sense: Russian producers make more money on fertilisers than on apatite. It will make no commercial sense for them to sell phosphate rock (apatite) to EU,” Włostowski emphasised. The industry says it is quite hard to find alternative sources of low cadmium phosphate rock. China, the largest global producer, does not export anything while Jordan and Egypt cannot meet the 20 mg limit. Another source could be Syria, but its phosphate rock deposits have already been captured by Iran and Russia – entities sanctioned by the US – taking advantage of the ongoing civil war, Włostowski explained. “Overall, any limit below 60mg effectively means the end of independent EU phosphate fertiliser production, which means giving away EU food security to the Russians. The real victim will not only be EU fertiliser producers but EU agriculture and EU geopolitical position,” he concluded. Rabat has been another EU supplier but may be ready to switch to other markets if Europe moves toward a 20mg limit. “Morocco can redeploy its high-quality sedimentary phosphate exports to other markets, given the sustained growth dynamic of world fertilizer demand. 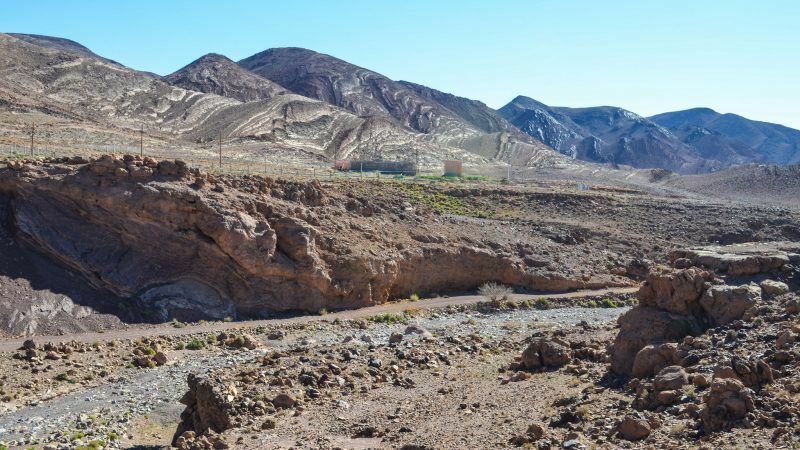 As you may already know, most phosphate fertilisers come from sedimentary rock and only 5% of global reserves consist of low-cadmium igneous rock,” a high-ranking official from Morocco’s government told EURACTIV. The official noted that such a low-cadmium limitation would trigger a substantial increase in EU fertiliser prices due to an inevitable dependence on the few suppliers of low-cadmium phosphates that could meet these thresholds. “This will significantly hurt EU farmers and will naturally affect consumers, which will ultimately impact the entire EU market,” he warned. “It is now up to our European partners, who have themselves defined phosphate as a ‘critical raw material’, to assess the significant economic and strategic risks this proposal would pose on the EU food security,” he said. Why don’t they chemically remove cadmium from the rocks? Are we living in the 21-th century? Where is the EU science and technology? Where is the EU chemical industry? Where is the EU enterpreneurship?